The Masters is well known as a “tradition unlike any other.” That extends to those who work on the competitors’ equipment. There are a few reasons for that. Just as the club has its patron policies against using cellphones and running on the course, it has a couple of rules that differ from a typical week on the PGA Tour as it relates to equipment vans and the tour reps who man them. To a novice, these rules might seem a bit extreme. But for tour reps who’ve worked the tournament before, they are challenges they’ve become accustomed to and, in some instances, even view them as a welcome respite from the weekly grind. Emergencies aside, most players have Augusta on their mind well before Masters week when it comes to their bats. Pena notes that 2009 Masters champion Angel Cabrera almost always will ask for a set of the company’s wedges with the TS (thin sole) grind, one designed to work well on the firm, close-cropped surfaces. Dill notes some will simply get new wedges in order to have fresh grooves to produce the maximum amount of grab, while Schomin said he has worked with Rickie Fowler and Bryson DeChambeau on new iron shafts in recent weeks. Rusty Estes, who reps for shaft makers Mitsubishi and Aldila, notes there is not a lot of trials as most of the component-makers don’t have credentials for that week, but if conditions change some players might look to do something different to create more carry if it’s wet. 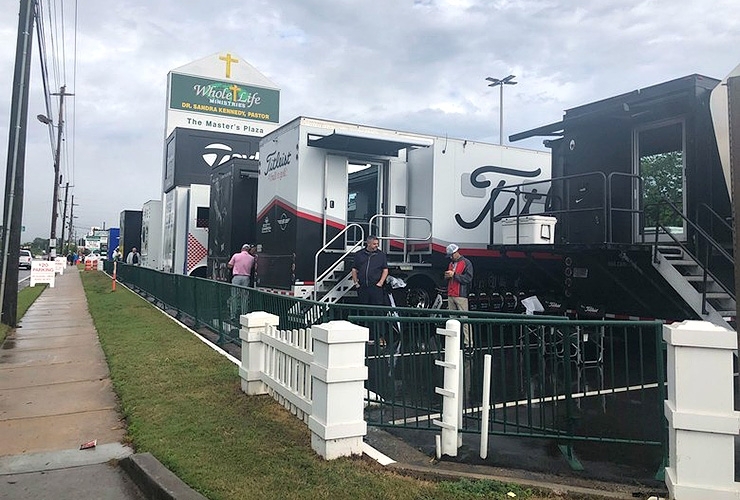 Making it an equipment environment, unlike any other week on tour.